– What did you get for Christmas this year? – What?!!! This year? But Christmas haven’t even happened yet! That’s the Repeating Joke in my family, year after year… Nobody is fooled these days – but we all still try. Today I just wanted to show you the stuff I got this year for Christmas 2009 in images. 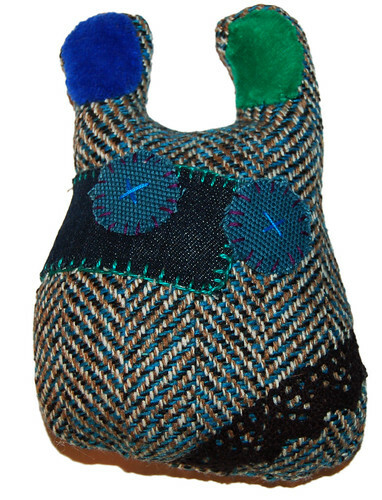 If you give me an a cute owl I think you know me well! 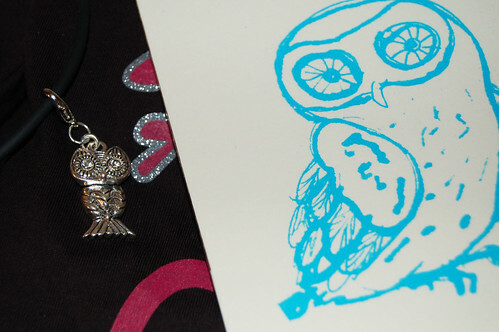 I got a necklace from my friend Maria and a owl print from my cousin Lotta for Christmas this year. I need to get a frame for the turquoise one – the color of the year! Love them both! Maria made a friend’s kid a little monster and when i saw it on her blog I asked her to make me one too. So this guy was custom made for me, and when I saw him it was Monster love at first sight! Now, I need to find him a name. Any suggestions? Do you remember the Photoshoped Pink Wish List I made? I didn’t get anything from that list but mom noticed the embroidery scissors and my wish for sparkly embroidery floss – so I got both. 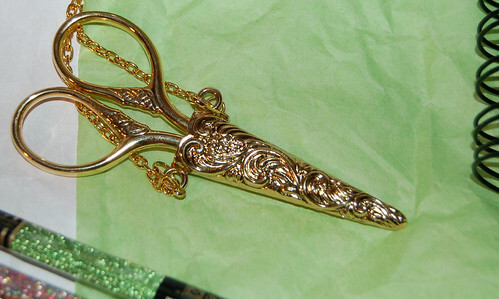 Not the kind that looks like a bird, but a pair of small and very sharp golden scissors – with case and chain to wear around your neck when you sew. I adore it! Tiny notebooks with the cutest covers ever. IiiI! 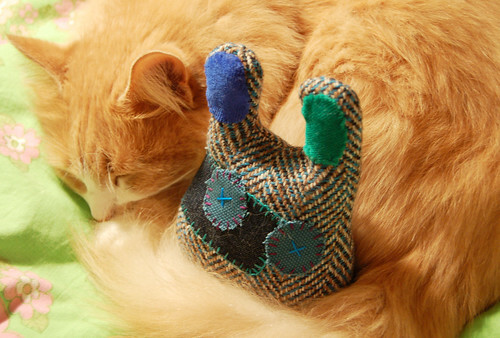 Smilla and Mr. Monster. He needs a name! The haul. 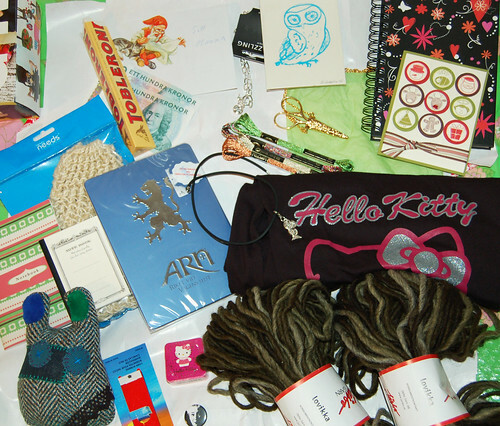 Most of the Christmas gifts I got 2009 (except the book load that haven’t shipped yet). 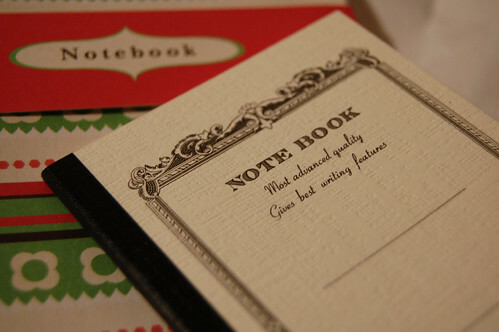 This entry was posted in Pretty things and tagged gifts recieved, new notebook, owls. Bookmark the permalink. Of course, I have to comment on Smilla! My little Kin is lying in exactly the same way right now, a little ball of fur. Sweet and sweet. You got some great loot for the holidays. This year, we decided not to exchange gifts, but to spend time together and buy ourselves what we needed. So far, I’ve bought lots of socks, especially the kind that go over the knee, and a toy Diana lens for my DSLR. We were technically not going to exchange gifts this year to save money but everyone found sneaky ways of getting around it. There weren’t lots of gifts this year, but what we received was thoughtful! Wonderful presents! I don?t know, I immediately thought that your little monster looks like a Fred. 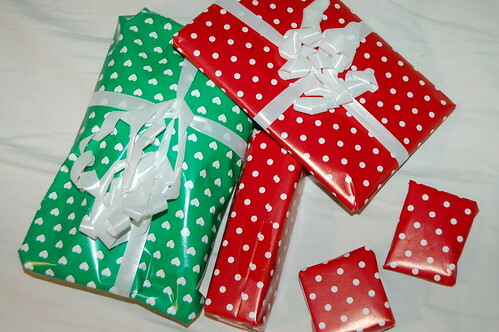 I got surprisingly many presents, I don?t expect much, since I?m single and very grown up, but I got quite a pile. No fun creative presents, but still good: lots of tea, a book, lip balm in a pinup tin, among others. And apparently have more presents to receive – lovely! The first name that poped into my head for the monster is Stewy (short for Stewart.) I have no idea why. You got lots of stuff! Very cool. The only crafty thing I received was Red Heart Eco-Ways yarn. Two skeins. Oh and a photo frame with a sort of paper pad as the frame so you can doodle around the photo. The other things were cookbooks, socks, DVDs and money. i got great things last year, http://silaenlaventana.blogspot.com/2009/01/cosas-ricas-para-lovelloux.html , i?m waiting forward this year, we have The Three Kings here, they come over the night the 5th-and we get up early the 6 and go everywhere to pick up and give the gifts..
you must have been a very good girl to get all those lovely gifts! Gorgeous, gorgeous things! And yes on more creative projects. Looking forward to what you might have in mind.